As I have mentioned before, I have not always been a huge fan of soy. Taste-wise or nutritionally-speaking. However, as I have tried to expand our diets to include more plant-based protein-rich foods, I have been exploring the role of protein in our diet and on our plates. In the past five years there has been an increase in research validating that soy, unless consumed in excess, will not cause hormonal disruption. Which means that if you have been avoiding soy with fears of increased breast cancer risk, worsening of PCOS symptoms, infertility, or thyroid dysfunction, you can rest easy and include soy 1-2 times per week. It’s well worth it if using a little tofu, soy milk or edamame helps you to reduce your intake of meat or dairy. Just remember, organic or non-GMO soy foods only please, and while increasing whole soy foods is healthful, continue to be wary of added soy in processed foods. 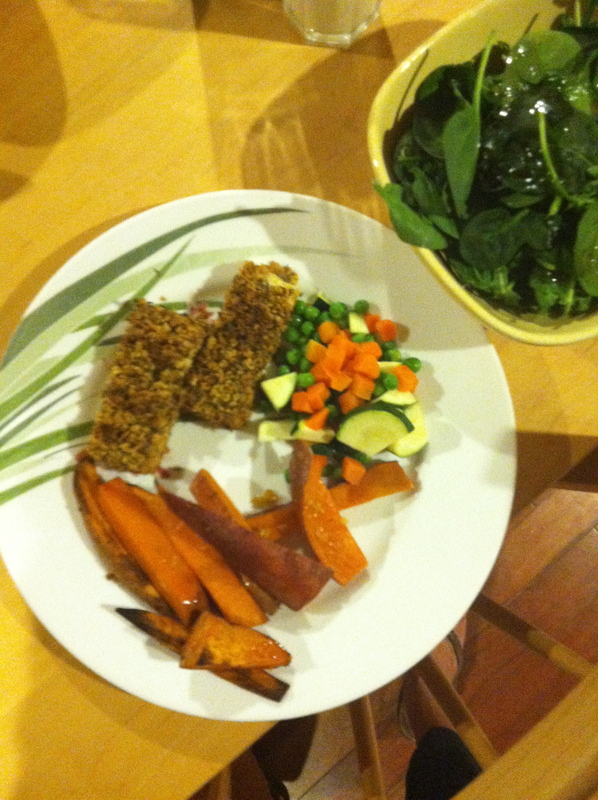 My most recent cooking experiment was Baked Crusted Tofu and I was pleasantly surprised! The baked tofu was firm, improving the texture, I thought, compared to moist tofu I’ve had in soups. Of course it also tasted good since I marintated it and crusted it with thyme. It’s true-Anything chicken can do, tofu can do too! Slice the tofu into 6 slices so that you have 6 rectangle-shaped pieces. Place tofu in a glass bowl, top with vinaigrette and allow to marinate in your vinaigrette while you prep everything else. You could also do this the night before or in the morning before dinner-time. 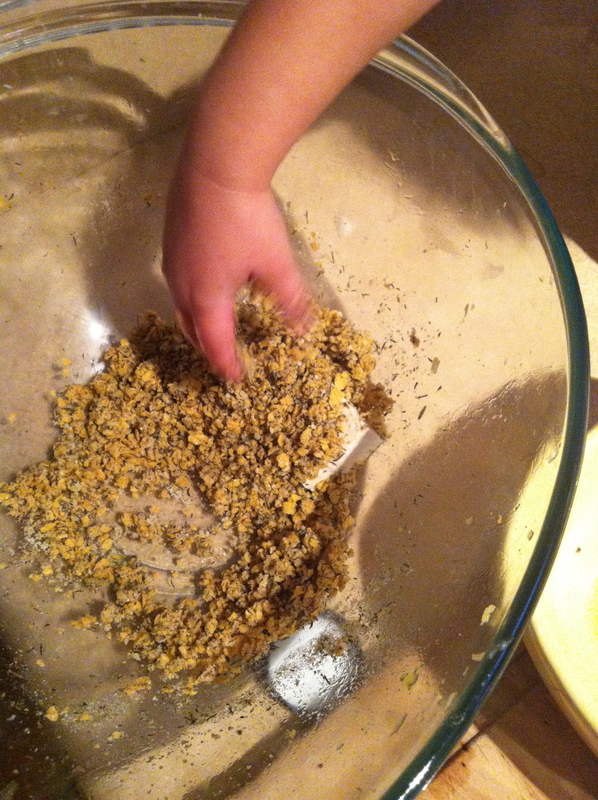 Process the dry cereal, thyme and parmesan in the blender until coarsely ground. You could also do this by placing ingredients in a zip lock baggies and rolling a rolling pin over the cereal until ground. Slice the potatoes into long “fries”. Place sweet potatoes into a large glass bowl. Mince the garlic with a garlic mincer and add to the sweet potatoes. Drizzle with olive oil and toss until very lightly coated. Get two baking sheets ready to use. Top one of these with a cooling rack for the tofu. Spray with cooking spray. Spread sweet potatoes onto a baking sheet. 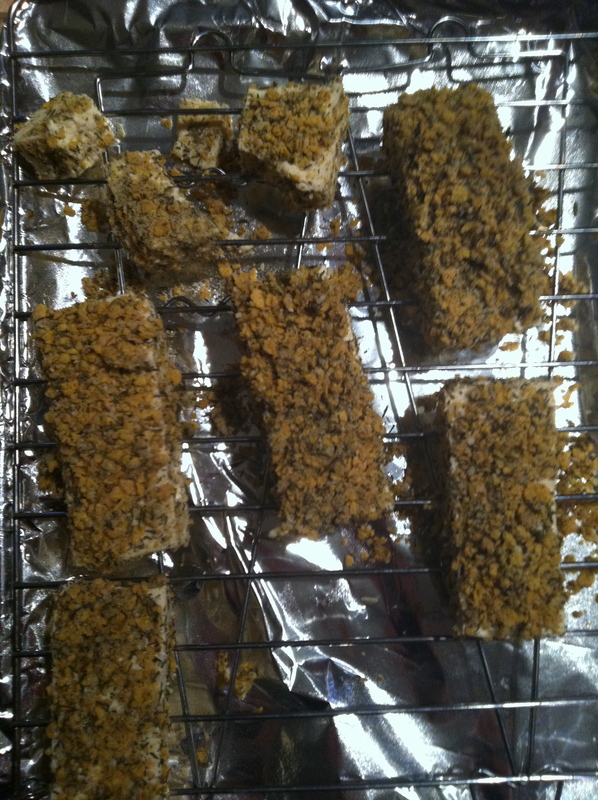 Remove each piece of tofu from the marinade and coat with the cereal mixture. Place tofu on the baking sheet with the cooling rack. Place sweet potatoes and tofu into the oven. 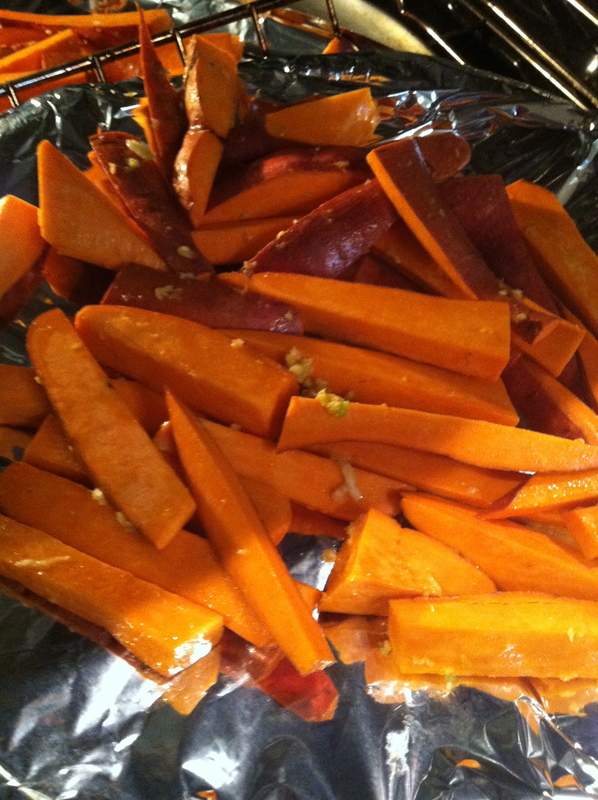 Bake for 20-30 minutes until the sweet potatoes are softened and browning on the edges. While everything cooks, make a salad and your veggies. I was going to make roasted vegetables but when I opened the fridge I realized that I didn’t have anything left!! So we had some frozen veggies with sliced zucchini. Crusting tofu (or chicken or fish) is pretty easy. Just throw mix crushed whole grain cereal or whole grain bread crumbs, with your favorite spices and viola! 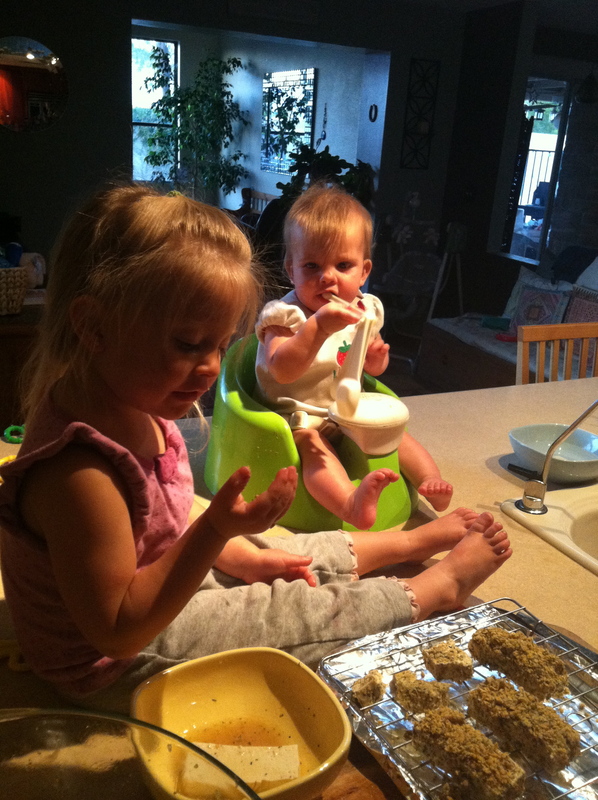 It’s a great way to get kids involved in cooking. I line my baking sheets with foil for easier clean up; the cooling rack is to keep the crust stuck to the tofu and not the baking sheet. Sara was doing a little taste-testing. She ate a whole piece of tofu while we were cooking! Here are the sweet potatoes ready to go in the oven. Here’s the finished product. Totally balanced-carbs from sweet potatoes, protein from tofu, fat from vinaigrette dressing, olive oil and tofu and fiber and antioxidants from tofu, steamed veggies and salad.